This is one of those "unsexy" bagged products that we generally avoid reviewing, at least while there are still weird, complicated dishes left on TJ's shelves that are as of yet unreviewed. But honestly, these understated little snackable morsels are what drew me to Trader Joe's in the first place, some 10 years ago. And not just the wasabi peas. When you're sitting on a park bench next to some local yokel that hasn't discovered Trader Joe's yet, and he sees you snacking on Orange Flavored (Dried) Cranberries, just think of the power you have over him when he realizes you're not snacking on raisins. Imagine that transcendent moment of mindblowing revelation that guy has—this poor schmuck who just realized that "craisins" were a thing—when he realizes you're snacking on orange flavored dried cranberries. Similar mind-altering epiphanies occur when that same dude who thinks you're crunching on peanuts realizes you're eating peas covered in wasabi mustard. If you're in NYC or L.A., you're probably thinking, "Yeah right! 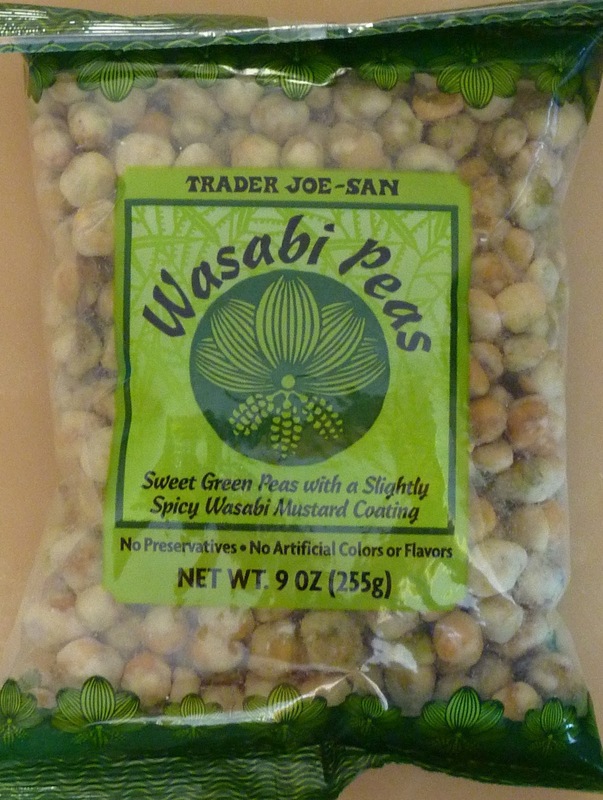 As if there are people who don't know about Trader Joe's Wasabi Peas yet." But trust me, in middle America, those people exist. They're still the majority in a lot of small towns. And I'm not belittling them. I used to be one of them. They're good, God-fearing Americans that aren't fortunate enough to have a Trader Joe's yet. But for the rest of us, the indoctrinated city-dwellers, Trader Joe's is nothing new. Sometimes when I'm meeting someone for the first time and I'm telling them about how I rob banks for a living, I often slip in something about my hobbies: this blog, for example. And I swear, on more than one occasion, the person has nodded his head, recollecting a life-changing event involving a stranger on a park bench with a mysterious snack bag, and said something along the lines of, "Yeah. That's cool. Trader Joe's. I love their wasabi peas." There's something iconic about these wasabi peas. And I'm not going to erroneously assume that TJ's is the only place you can get wasabi peas. But I might make the bold assertion that TJ's is the leading force in the world for making wasabi peas mainstream. They didn't invent the orange craisin. They brought the orange craisin to the masses. Actually, maybe Ocean Spray did that. But that doesn't support the point I'm trying to make. So never mind. As for the peas themselves, they're very crunchy. They don't taste much like peas to me. It's more of a nutty flavor. They're similar to peanuts in terms of size and crunchability, too. Their wasabi level is not unlike that of the wasabi seaweed. Wanna freak out a Canadian tourist? Eat wasabi seaweed next to him on a park bench. Say, "They don't sell this at Tim Hortons, eh?" Can you tell I'm bitter about the USA not even medaling in hockey? So if you haven't checked these peas out already, go ahead and do so. Find your favorite park bench and blow someone's mind. Be warned, though, it's difficult to eat a bunch at one time. Try them on a salad or in soup. They're tasty-ish, but the novelty factor does wear off eventually. Sonia gives them 3.5 stars. Me too. Been tempted to try em, but I get better wasabi peas elsewhere, at least based on the numbers and ingredients (Feng Shui brand).